In July, MSF partnered with Community Outreach Ryders to host a uniform and school supply giveaway. 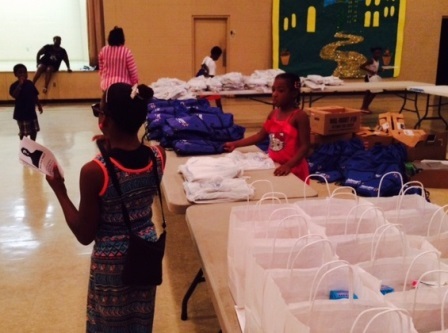 The children received bags filled with school supplies and uniforms at the event. MSF also gave the elementary-aged students lollipops with encouraging phrases while the middle and high school students received care packages filled with personal hygiene products with inspirational sayings attached to the bags. MSF: Why did you volunteer to run the No Bullying part of the event? Dianna: As a fellow member of MSF & a sibling of the Singleton family, I felt as though it was my duty to help out wherever I could. I also sense a lack of education when it comes to bullying in the school system & even though this was one town….every little bit helps. I can remember being bullied as a child & had I known the proper way to handle being bullied & bullies themselves I could have had an easier time at school & in my neighborhood. Cher: There was a need. MSF Juniors were not available for the event, and I felt that it was an important part and needed to have someone facilitating it. I was a little nervous about it, but I felt that I would be able to set my feelings aside for the sake of reaching out to the kids. MSF: What kind of impact do you think the No Bullying campaign had on the children and the parents? Dianna: I think the majority of the children took what was being told to them seriously. Playing the line game brought bullying to the forefront of the children’s brains. It got them to think about not only if they’ve been bullied but if they’ve ever bullied anyone else. The majority of the parents were ecstatic that MSF brought the No Bullying Campaign to their town because their child has either experienced being bullied or were the bully themselves. Even when the child was uninterested in participating, the parent persuaded them to do so anyway. It was a nice sight to see! Cher: I think the no bullying campaign made the kids and parents admit that bullying occurred in the schools and rather than just count it as a part of the system, we encouraged them to realize that it was a bad thing. I think the kids definitely understood what we were trying to get across to them. MSF: What was your favorite part of the event? Dianna: My favorite part of my portion of the event was seeing how honest the majority of the children participating were. It was a relief that they were so cooperative & genuine about the line game & things that they’ve experienced when it came to bullying. Cher: I would have to say the no bullying, just because that’s where my contribution was and that is what I experienced. I enjoyed some of the parents and kids who were taking the no bullying event seriously. MSF: What impact did the Donaldsonville event have on you? Dianna: Even though my family moved from Donaldsonville when I was a young child, I still feel a great connection with the town. Being able to help out where I’m from makes me feel as though I’m doing a great service for my hometown to grow & be better. Dare I say, it makes me feel quite altruistic. Cher: I saw first-hand what the need was. I really saw that there is a lack of focus on education overall. I felt like we were there to help the kids and make them feel important and that their needs were being met. MSF: Is there anything that you would like to add for future events? Dianna: I would like to have more time to prepare an even better presentation for the No Bullying Campaign. I felt we did a decent job despite this. Cher: I would like there to be a way to make a bigger impact. The supply was there, but we didn’t have enough turn out. We need to make it known and find a way to draw people in. More educational proponents would also be good. MSF: What did you want the children to take away from the No Bullying event? Cher: I wanted the children to recognize that they have seen bullying, whether they were the bully or the victim. I wanted them to realize that bullying is not okay, and that they could help make a difference. From what I had been told about the local schools, there wasn’t a question about whether bullying existed… the kids might not have anyone else to tell them it’s not okay. MSF would like to thank all of the groups and volunteers that helped to make the event a success! You can view more pictures from the event on our Facebook page.